If you’re a Skinnymixer, you know I don’t eat seafood… and I definitely do not eat prawns. For a really long time I also refused to cook seafood in my Thermomix because I felt like I could NEVER get it clean enough! Since I got a dishwasher (best.thing.ever! ), I have been a little more relaxed with this rule. M has been pretty awesome over the past two weeks, having lost 8.3kg (you can read more here), so it was time he was rewarded with something yummy but super healthy/compliant. This is a great “base” recipe, which you can add different things to if you don’t have to be so restrictive like poor M does for now. Weigh in 300 g or 10.6 oz water to mixer bowl, set for 8 min/steaming temperature/speed 2/MC on. Insert simmering basket and put your prawns inside, cook for 3 min/steaming temperature/speed 2/MC on. 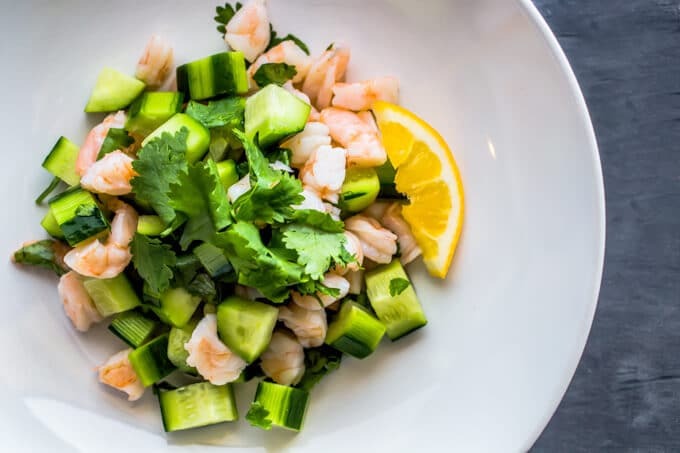 When the prawns are finished, immediately put them into cold water with the ice to cool, while you prepare your salad. Drain prawns well, cut your prawn meat into small chunks, stir through salad and you can either let it marinate in the fridge for a few hours or serve immediately. This serves 2 on Phase 2 of the HCG Protocol. You can increase the ingredients as required. Feel free to play around with the ingredients and seasonings.. this is just to show you how quickly and easy you can cook up a healthy light meal. Add a nice big dollop of my aiolifor a great LCHF meal. At step 1 use ST temp if using an Intelli, use 120°C or 250°F if using a Supercook. At step 2 use ST temp if using an Intelli, use 120°C or 250°F if using a Supercook. Thought you couldn’t have avocados on hcg2? My fav summer time meal! 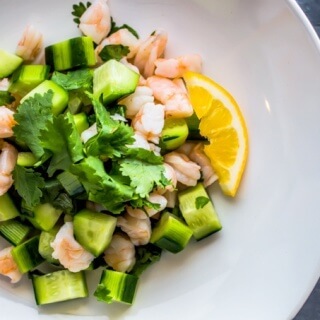 Love the Skinnymixer’s prawn salad ! Why?…because it ticks all the boxes for so many reasons !! It is healthy …full of goodness. . nourishing. ..
Colouful to the eye and tastes fantastic !!! What more can a gal say !!! This is awesome. So simple. I am on the 5:2 diet and I had this on my last diet day. Simple to make, tasty and filled me up. It was so low in calories that I could even add the avocado! Thanks Nik!! !